The Way I Feel is a series of 7 bilingual picture books in a set. It is written by Cornelia Maude Spelman and illustrated by Nancy Cote. To date, more than 1 million copies has been sold worldwide. It is natural for young children to experience certain emotions in their growing up years. Written by a former social worker, The Way I Feel is designed to help young children recognise and manage the different emotions, such as anger, fear, sadness, jealousy, etc. The author has cleverly made use of little animals that young kids can easily associate with, such as bunny, bear, cat, in her books. 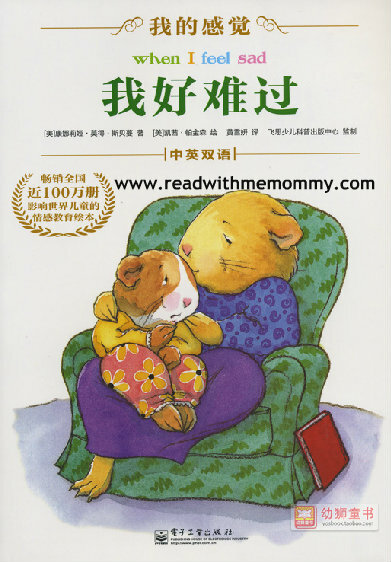 To illustrate, in one of the titles, When I Feel Scared, teddy bear shared that sometimes he feels scared when there is a loud noise, or when he has a bad dream, or when mother goes away....Scared is a cold, tight feeling. He'd cry. He want to run away or hide. He want someone to hold him... Then the book goes on to assure young readers that it is natural to be scared sometimes..... More importantly, the book explains how to manage fear. Teddy bear can cuddle with someone, with his blanket or stuffed animal. Or teddy bear can get into a cozy place or look at his favourite book. And how he can learn not to be scared.... Teddy bear can learn to look under the bed to see what's there. He can learn that the dark can be nice. He can learn that mother goes away but she comes back again.... so when teddy bear feels scared, he now know what to do! This is a very useful set of resources for parents. 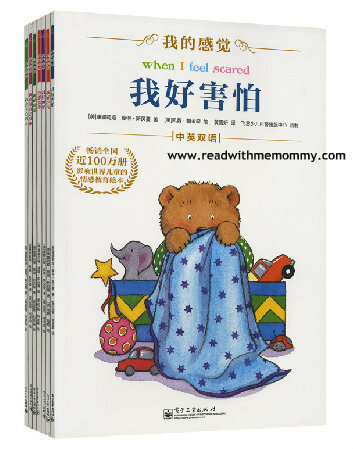 The books are in soft cover, and are bilingual books (English & Chinese). Simplified chinese. For reading to your kids, this series may suit children of 4 years old and above. For self-read, it may suit children of 8 years old and above.